On February 6, 2018, Westmont Fire Chief David Weiss was re-designated as a Chief Fire Officer (CFO) by the Commission on Professional Credentialing. This designation, which is the highest level of certification for Fire Department personnel, will be valid for a period of three years. The CFO designation is evaluated in four areas: Professional Development, Professional Contributions, Active Association Membership, and Community Involvement. Chief Weiss has been an active member of the Illinois Fire Service community for over forty-five years. 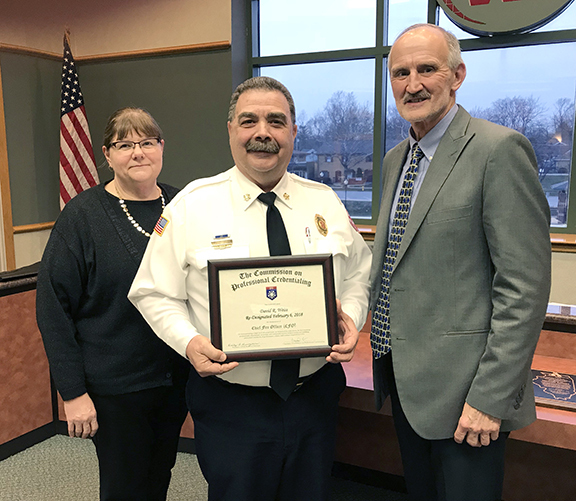 After retiring from the Lisle-Woodridge Fire District as Battalion Chief in 2006, Chief Weiss was hired as the Westmont Fire Chief, where he had worked part-time for seventeen years. Under his leadership, the Westmont Fire Department received its first ISO Class 1 rating from the Insurance Services Organization in 2017. The Village congratulates Chief Weiss on this recent accomplishment and thanks him for his dedication to excellence.